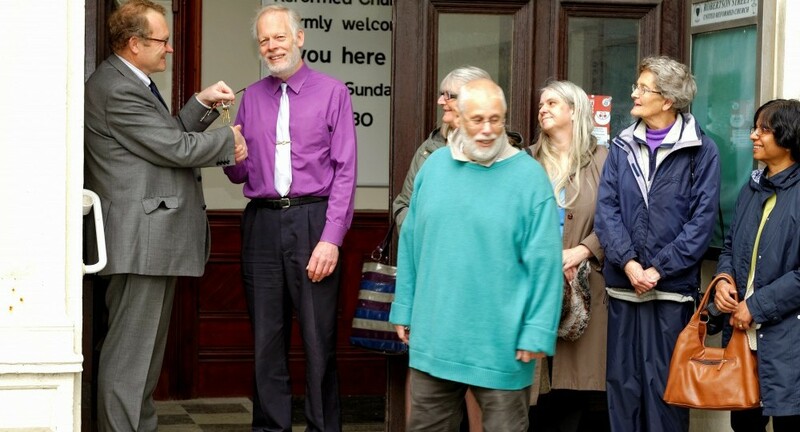 REVIVAL FERVOUR has found a new home in Hastings, as His Place Community Church has moved into a listed building dating back to the town’s previous religious awakening of the 1800s. The 60-strong independent charismatic church has bought the old 800-seater United Reformed Church in Robertson Street for an undisclosed sum after the huge church closed at the end of 2012. Now they plan to turn it into a café, Christian bookshop and prayer facility – as well as a worship centre. Church leader Rev Chris Sears MBE – who received the honour for his work among the town’s homeless – is convinced their latest move is part of the preparation for a new spiritual movement. “I really believe revival is coming to Hastings,” he said. His Place Community Church started as a group meeting in Chris’s home in 1984. From there, they moved to a community centre at Hollington, then a mission hall in St Leonards-on-Sea. In 2000 they also opened a café at St Leonards. Most recently the congregation felt they should move into the old URC building, which had closed down last year. Through savings, an individual donation and a special arrangement with the charity that owned the facility, they were able to buy the church outright. “I thought, no, I don’t want to do this – I’m 62 now,” Chris joked. But he felt compelled to follow it through, particularly because of his belief that revival was on its way. The old building dates back to a period of spiritual awakening in the 19th century, when a wave of church planting swept through Hastings, led by Congregationalists. The structure is also next to a shopping precinct, which fits the church’s belief that God has called them into the marketplace. They have adopted the “transformation teachings” of Argentinian evangelist Ed Silvoso. “We have just been so blessed,” said Chris.